In order to enjoy the best of the National Park you have to stay within the resort as most of the tours will either very early in the morning or finish later in the evening. There are only a couple of good quality hotels available in the resort and Desert Garden is one of them. One of the activity shall not be missed is the sound of silence dinner. It shall definitely be a memorable evening. It was a unique experience. My only beef was that we had to wait over three hours for the room which I feel could have been logistically managed more efficiently given that there must be guests departing on the morning flight we came in on so not every room becomes available only at 3 pm. Aircond in the room was not working properly made the stayed a bit uncomfortable especially during hot summer weather. The technician couldn't fix it. Being offered either to change to a different room or being provided with a standing fan. We chose a standing fan instead since we just going to stay there for one night only. Stayed at Desert Gardens for one night had a room with a view of Uluru was very expensive but worth it sat on balcony in the afternoon amazing view again had breakfast on the balcony only complaint bed should have been on other side of the room so you could sit up in bed and enjoy the view. main reason for visit was to go to Field of Lights absolutely amazing!!!!! We had a three night break at this hotel I was aprehenssive after reading reviews on this site. We arrived to find our room not ready we were told to go for a walk and come back in an hour this we did our room was ready at 3.45pm we were told that out luggage would be delivered in 10 mins as we had a long walk to our room, 2 hours later after two phone calls we got our luggage. The following two days we had our room cleaned a 30 second flick we had to ask reception for clean towels and tea/coffee we made our own bed, at $288 per night without breakfast I do not expect to have to ask for clean towels and make my own bed. The room was good and clean we ate in the restaurant and the food was good, the staff were friendly and eager to please,housekeeping is an area of concern they appear to be under pressure I cannot understand why management has not picked up on this. During our stay we went on three trips Sounds of silence dinner,Walk round the rock at sunrise,and a trip to the Olgas all memorable in different ways I hope this review helps. A lot of money for what? Nicely renovated room. Could do with a little space/desk to be able to do some work. Front desk staff are very friendly and helpful, and good to see staffs are from different background to cater for all the tourists that stay there. A lot of the exterior lights not working and bulbs need replacing. Pretty dark in some part when getting to room at night. Booked a table for 6 for dinner at the restaurant, and when we turned up, staff informed me there were no booking and to wait at the bar till they have a table. Went back after 25 minutes to see what's happening and informed another staff at the desk the situation. She found the booking and we were seated within 5 minutes. Maybe staff need to be a bit more attentive/thorough when checking bookings/availability. Had issues with TV reception. Rang reception and was informed it was the weather. It was still the same the next day. Got the maintenance guy and they found the cause. It wasn't the weather!!! One of the glass had a chip and crack and was placed back in the room after the room has been cleaned. Found dried insects in the room, which I expect being in the desert, and left it on the carpet where it can be vacuumed. It was still there when we got back that night. Maybe a bit more attention to details doesn't go astray. Perhaps staff training needs updating? The shuttle bus between hotels is very handy and convenient. Overall, a good place to stay. Desert Gardens Hotel is located at the heart of the desert. Therefore, it is very convenient to reach Uluru and sacred places. It was a nice experience for all of us. We enjoyed the sun set and the rise of the sun. Check in was fast and efficient with unswerving smiles to every strange question that was fired at the staff. Once I got to the head of the cue I was booked in and directed to my room very quickly. I got hopelessly lost but through no fault of anyone except myself. Its a large, sprawled out motel. My room overlooked the rock. The building itself looked a bit tired but it is exposed to some extreme weather. Everything worked in the room and aircon coped well. The bed was great. Breakfast was typical accor fare and was good for the price. The gardens were nice to walk around and the pool looked inviting. There was plenty of parking. Check out was fast and friendly. Recommended. Accor seems to run all the properties around the ayers rock resort. So they charge whatever they want. Room was average but and pricey but you really don't have a chose. Breakfast and dinner was Also very pricey and the transport that was offered to get to ayres rock. Well, much like Disneyland a rock in the outback is reason enough to extort money from its guests. I will say that the final given room was nice,although thank god as a Gold member I got the mountain view upgrade free rather then paying for what was view of one third of Ayers. Staff are surely nice and accommodating but light years away from handling Accor premium guests, not knowing at all the privileges bestoved. Anyways, regular 4 star standard to Tokyo prices, breakfast is 38 lovely Dollys a head, which makes even Sofitel in Sydney fall behind on its 32$. As the whole resort evolves around a highly elaborate monopoly of Voyages resort there is zilch you can do about it....even the employees are too scared to mention it. Then there is the wondrous question why oh why do we have a pool that is not heated? There are two pools at the whole site, why make one heated and the other ice cold? It should come as no surprise that temperature every night drops to zero so water gets chilling. So let ALL the guests walk from one hotel, a mile to another to jump in that pool and then walk back again. I will say though, how expensive the Sounds of silence dinner now was, it was a lovely treat and well worth the visit. Just kill the monopoly of Voyages and let the free market have its go like in the rest of the world and I am sure it would benefit tourism. There's not too many hotel options in the area, just the ones of Accor complex, and the prices are almost the same. The hotel is cozy and the place very beautiful, but nothing the justify this expensive rate. We enjoyed our comfortable room and courtyard with it's nice view to the pool area. The staff were always polite and helpful and we especially enjoyed our dining experience. The food and service by Florian was excellent. The rooms were spacious, clean and roomy. The bathroom was well provisioned. We had a good view of Uluru. The food was good and well priced with our Advantage Plus card. The staff were polite and helpful and the link between the hotel staff and the tours was well co-ordinated. The Sounds of Silence dinner was well organised and fun. The facilities, people & food were all just great! The check in process was quick and smooth, room ready very quickly and the resort's facilities were all clean & tidy. We thoroughly enjoyed the resort. There aren't many options in Yulara, but Accor had a sale, which made the Desert Gardens hotel only around $200USD a night (I've seen it as high as $400 per night in the past). How this hotel passes as a 4 star hotel is beyond me. Even though I got an upgraded room, it felt like a prison. Yes, I woke up with a cockroach crawling down my face, but that is to be expected when you're in the Outback. The main issue with me was the lack of indifferent service from most the staff. We had to move rooms because the cooling system in our first room didn't work. They moved us to a second room, in which the cooling system worked at first, then it stopped working again at 2AM in the morning. By that point, it wasn't even worth it to move, since the check-out time is at 10AM. When we mentioned the room conditions when we checked out, the staff seemed indifferent at best and couldn't even offer an apology. 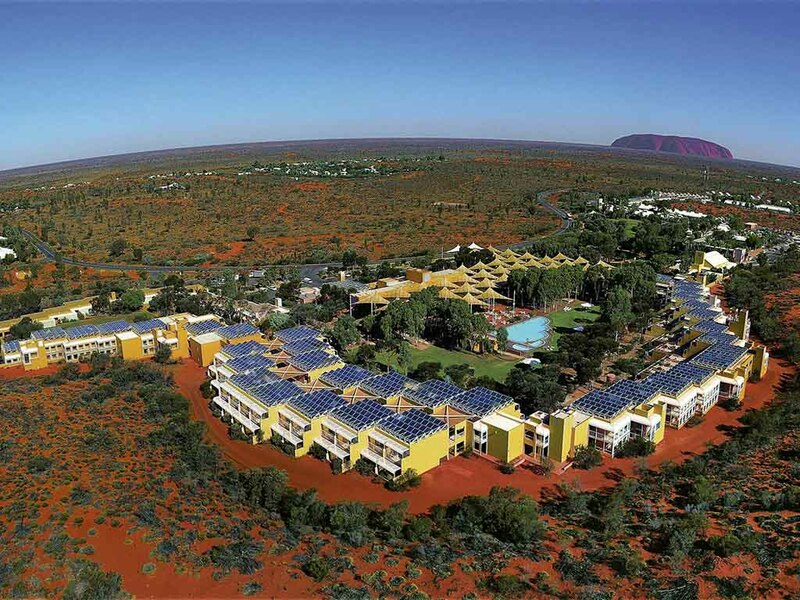 This is the best of the Ayers Rock resort properties at Uluru - both this resort and the great Monolith are worth the visit. The staff were nice, though the sales staff I communicated with by email were a bit friendlier than the on-site staff, everyone here is good, helpful. This resort does a great job of making you comfortable in the desert where temperatures can reach and exceed 100 degrees.